Let‘s face it: salary is always a key factor in employee recruitment and retention. Employers that pay better than average wages tend to attract (and keep) the highest quality employees. While salary isn’t everything, it does factor heavily into an employee’s perception of their own value within the organization. The only way to compensate for low wages is to provide an exceptional work environment with opportunities for career development. Employees do place a fair amount of value on a comprehensive benefits package. Benefits that employees find desirable may include many different options including health insurance, dental insurance, paid vacation, sick leave, maternity leave, tuition reimbursement, housing allowances, travel compensation, training courses, and the opportunity to gain industry certifications. Having a good work/life balance is always a plus for workers, so they tend to value the chance to have flexible hours. Employees tend to favor jobs where they can have earlier or later start times. They also appreciate the ability to work from home, either during normal work hours or to finish up projects that could not be completed at the office (in the latter case earning some compensatory time or extra pay depending on the nature of their employment). A flexible schedule can be particularly valuable for those with kids, pets, or other family commitments. Employees like to know that there is a pathway that will allow them to move up the ladder in an organization. They do not want to be stuck in a dead end job with no possibility for career growth and development. Employers that promote from within and offer development opportunities will have a higher rate of employee retention than those that do not. It is always nice to be recognized for contributions at work, whether this recognition comes in the form of verbal praise, promotions, bonuses, or other perks. 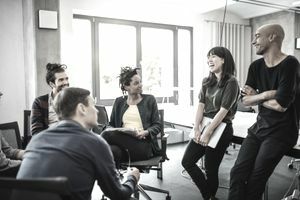 Even organizations that can’t afford expensive rewards programs can instruct the management team to let employees know when they are doing well. An employee of the month program is just one example of a zero cost form of employee recognition. Leadership starts at the top, and a poor management team will discourage even the most dedicated group of employees. Organizations with strong leadership and vision will be able to hold on to quality workers. At the very least the management team should be involved in goal setting, enforcing company standards of performance and behavior, and recognizing the contributions of various team members. A good team is critical to the success of a business, so co-workers are very important to an employee’s perception of their job. If the team doesn’t function it can cause big problems over the long term, leading to higher than normal levels of employee turnover. Management can often be helpful in correcting problem behavior before it becomes pervasive throughout the team. A positive work environment includes many factors, and businesses would be wise to check as many of the boxes as possible. Employers that do not provide a quality work environment will have to deal with an increased number of employees turning in their resignations to pursue employment with those that do.